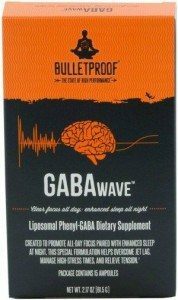 I’m on Dave Asprey, The Bulletproof Exec’s, mailing list and saw he launched a brand new brain supplement called Bulletproof® GABAwave™. Talk about how the world times things. I say that because I have just been delving deeper into the world of nootropics. Maybe an easier way to think of them is to call them “brain vitamins”. I got that one from the Evan Brands’ Not Just Paleo podcast episode 82 with Chris Walker. It was in that episode that I heard Evan talk about a co-worker of his years ago who looked like the happiest guy in the world. Turns out he was on massive doses of phenibut. After hearing Evan and Chris talk about all kinds of smart drugs I wanted needed to go researching what is phenibut on Google and enter this world of neuroprotective drugs. The video above probably explains it very well for someone wanting to know the chemistry. I’m more interested in the effects and side-effects. Seems like phenibut (Phenyl Gamma-aminobutyric Acid) is like taking a downer without the major sedative effect. It is meant to be much better than plain old GABA supplements, because it can cross the blood brain barrier. From what I read on Dave’s info was the normal warnings of heavy machinery and pregnant women, however, it does seems the sedation effect could heighten other pharmaceutical medication further. The site says “can increase the effects of tranquilizers, narcotics, and neuroleptics”. So if you take these drugs phenibut side-effect warning for you. In the podcast with Evan and Chris it was said how nootropics are meant to be non-addictive. The story of the co-worker showed at very high regular doses you could become addicted. I see there is a 36 hour window before you are allowed to take another GABAwave ampule. I don’t think most people take into consideration body weight and dosage. Like when a doctor is prescribing medicine they have to adjust the dose according to a patients weight, I think, you should consider the same clinical thinking with vitamins, minerals and nootropics. I like the Upgraded™ Self products, which is why I wrote my Bulletproof® coffee review. When it comes to Dave’s Bulletproof supplements I have tried the Bulletproof® Aging Formula and the Bulletproof Unfair Advantage which I love! I really feel mentally sharper on a PQQ supplement. Since this GABAwave™ just launched I haven’t had a chance to try it out and review it yet, but I can’t wait to one day. In the meantime I just received my Noopept/Citicoline stack which is yet another type of nootropic. This one is a stimulating one that I want to try first. I like seeing it is meant to be beneficial for vision problems from glucoma after seeing my 23andMe results (sign up for my mailing list to keep up to date).